As we inch towards the end of the year we are also heading towards the end of Season Eight. Season Eight which can be considered Sweet and Sour due to a large number of changes this season including the complete revamp of Rune system. Tons of items were also changed throughout the year and many champions were given a mini rework or a major rework in few cases. This has left a dividing impression over the community with many casual players leaving the game as the changes are more directed towards pro play. Get all the latest news on LoL World Championships 2018 only at Sportskeeda. This being said one of the most appreciated things Riot did this season is the quality of skin released and we are about to get another one. 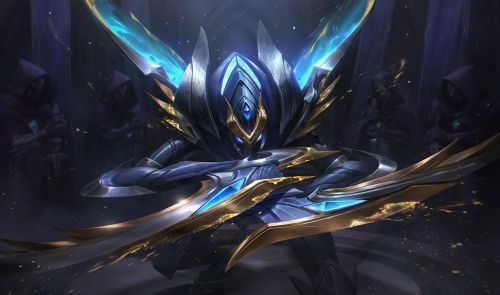 Like every year Riot is releasing a championship skin to mark the start of Worlds. Kha'Zix will be the newest champion to join the likes of Thresh, Kalista, Shyvana, Riven, Ashe, and Zed. Kha'Zix was one of the most popular champions of the year both in Solo queue and Pro play. Championship Skins are usually 975 RP or 1350 RP in some case. They generally look stunning visually but don't have much change to animations usually with backing animation only being different from other skins. Kha'Zix can be seen holding two flags in his backing animation, unlike previous years where champions usually had a throne. Kha'Zix can be seen with a Bluish color with a little pinch of Golden around his head. This, however, can be further enhanced with Kha'Zix abilities as you level him up. If you evolve either of Q, W or E Kha'Zix will get a golden ting around his wings whereas if you evolve his R first he will turn into Reddish Silvery Bug. This feature seems really cool as players can choose accordingly. The Skin is expected to hit live servers in patch 8.19 and the cost of the skin has not been revealed yet.